An unusual Passion Flower, clothed in rose-pink, double blooms. A beautifully exotic, pink Passion Flower, with unusual double, star-shaped flowers which are unusual for passifloras. A slow growing, compact vine, absolutely ideal for growing in pots, as well as in flower borders, against trellis, over obelisks - the choices are endless. Long flowering, a continual procession of sparkling, rose-pink blooms appear from May to September and are followed by attractive orange fruits. Hardy down to -6C we recommend growing it in a pot in the conservatory or on the patio for the best flowers. 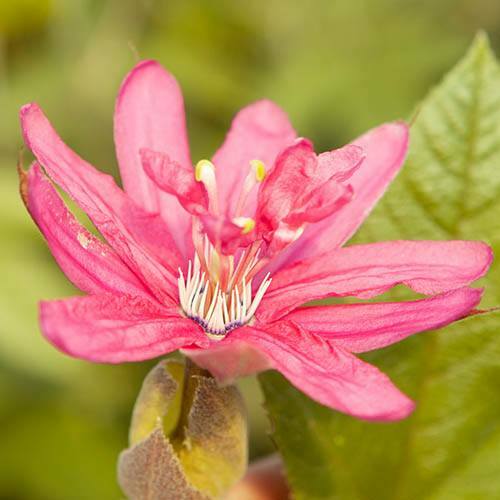 A beautifully exotic, pink Passion Flower, with large, double, star-shaped flowers which are unusual for passifloras. This rarely offered variety, 'Rosea', is a slow growing, semi-evergreen, compact vine clothed with gorgeous triple-lobed, light green leaves, and twining green tendrils which help it to cling to its support. Its smaller stature means that it is absolutely ideal for growing in pots, as well as in flower borders, against trellis, over obelisks - the choices are endless. Long flowering, a continual procession of sparkling, rose-pink blooms appear from April to September and are followed by attractive orange fruits, which hang from the vines like glossy jewels. This passionflower is borderline hardy in UK winters (down to -6C), so we recommend growing it in a pot in the conservatory or on the patio and moving it into a frost-free place to over-winter. As a deciduous climber, it may lose its leaves, but they soon return in the spring. Supplied as 1 x established plant in 3L pot. Growing passion flowers indoors is as easy, you just need a big pot and plenty of light. Plant your vine in normal potting compost (with added John Innes) and water regularly. Your plant can be moved outdoors after all danger of frost is past and allowed to grow normally in full sun. Then, in autumn, cut back the growth to a reasonable height and bring it back indoors - it's that easy!